Following our visit to the National Heisey Glass Museum located at 6th and Church Streets, Newark, Ohio on Aug. 27, 2004, we feel qualified to say that NO carnival glass was ever produced by Heisey Glass. The Museum is owned and operated by the Heisey Collectors of America, Inc. since 1974. The Collectors' Society was founded in 1971. 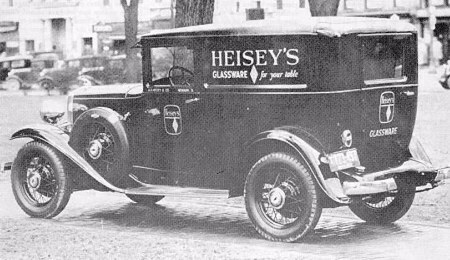 More than 5,000 pieces of glassware produced by the A.H.Heisey & Co. in Newark from 1896-1957 are housed there. Also on display are molds, tools, etching plates, factory designs, samples and “whimsies”. The Collectors' Society added a new wing to the Museum in 1993. A gift shop is available on site. We spoke at length with a member of the Collectors' group, a local lifelong resident of Newark who is now in her early `70s. She has volunteered her time to the Museum for the past fourteen years. During that time, two Museum Curators have prevailed, and neither of them find evidence that any carnival glass was ever produced. 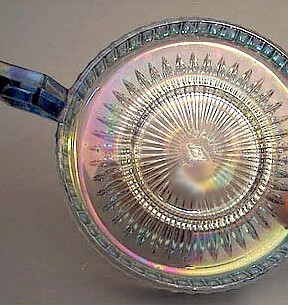 1916 HEISEY Breakfast Set-Smokey blue flash iridescence. The Diamond H logo found in some examples of Heisey Glass, was designed by the son of A.H. Heisey while attending college. 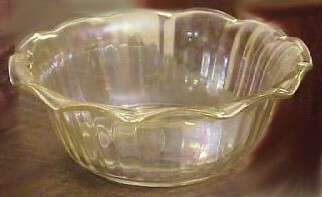 At the time Heisey ceased operations on Christmas Eve, 1957, all molds were sold to Imperial Glass Co. of Bellaire, OH. 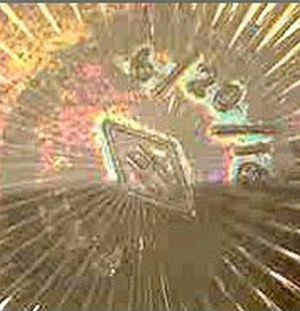 Shortly after the formation of the Collectors' Society in 1971, enough monies were appropriated by that group to buy-back the “rights” to usage of the Diamond H by Imperial. 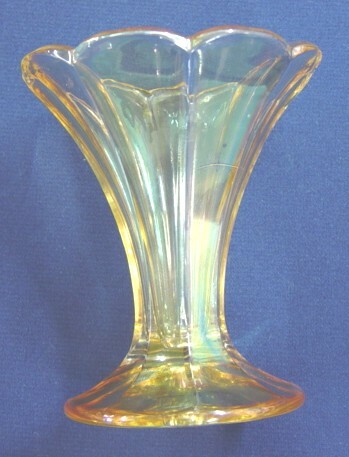 HEISEY Colonial pattern - 4 1/2 inch vase-flashed marigold. Two of the examples of “Heisey” patterns we display in this segment have been seen in sale ads from the “vintage” category of carnival glass offered over Ebay. The vase was included in a recent Reichel Auction. As we handled it, we could determine it to have been nicely iridized in a radium-type finish. It sold for a substantial amount. 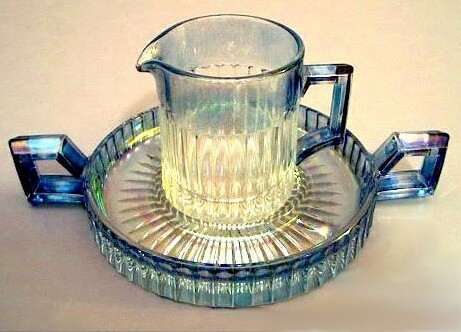 There are no known carnival glass pattern names to apply to any of these pieces. "Heisey never made any carnival glass -- that can be said with certainty. However many pieces of Heisey were given a carnival like treatment. Many companies purchased Heisey blanks and decorated the pieces with cuttings, etchings, painting, and even carnival treatment. I can remember back in the '80s a barn full of Heisey was found in New England that had all been given carnival treatment by a lady who did it as a hobby. Very few pieces of Heisey were given a carnival treatment by Imperial - the story book mug and the top hat match holder being the only pieces that come quickly to mind as being given that treatment after the Heisey factory closed." consensus of most knowledgeable researchers today is that they did not. This would be especially unlikely during A. H. Heisey's lifetime, since his emphasis from the beginning was on the clarity of the crystal. Ruby stain and other decorations offered by the company in the early years were used only to enhance the pieces and never allowed to interfere with the overall fineness of the crystal. Based on the known opinions and beliefs of A. H. Heisey, a carnival finish is highly unlikely. Most of the iridized Diamond H pieces seen today are from the 1920s and were done by the Cora Carter Studio in Newtonville, Massachusetts. 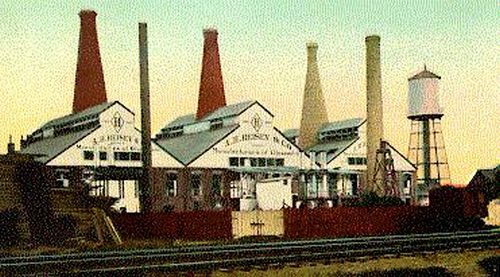 The Spicer Studio in Akron, Ohio (distributed by Howard Seldon in New York) also decorated some Heisey blanks with "Amethyst, Amber, Blue and Rainbow luster," according to an ad from 1921. 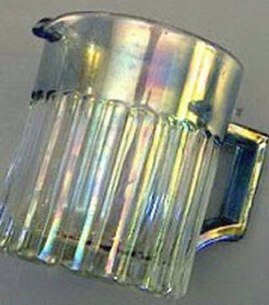 Based on the existing Trade Journal information, it is an accepted belief that the iridescent Heisey pieces were all done by decorating companies in the 1920's. Yes, I should have clarified my clarification. The barn full of glass found in the 1980s was left over from the 1920s. (Wouldn't it be nice to make a discovery like that?) Walter's (Heisey Museum curator) description implies that Cora Carter was an amateur decorator, and that's where I disagree with him. She may (or may not) have done all the work herself, but as far as I know she sold her pieces commercially, so what was found in the barn was leftover stock from her business. Her business was in operation in the 1920's. Without sowing of the grain. Instead of giving up on a person, give that person to God. *INSIGHT*~~ People who explain God in simplistic formulas are on a collision course with disappointment. The reality is that God's workings are often beyond our comprehension (Isaiah 55:9). When things don't make sense, remember that God has more information than we do. We need to trust Him.